Ask our receptionists if you have any other requests. We will be happy to help you. Your satisfaction is our priority. The reception desk is open 24 hours a day. You would like to visit Strasbourg, but you don’t know where to start? Our multilingual receptionists will be happy to help you in planning your visits and recommend restaurants and tourist sites. 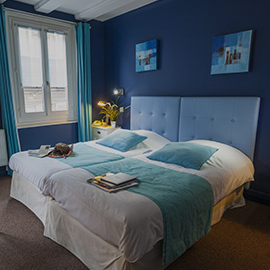 We do our utmost to make your stay in Strasbourg the most comfortable possible. Don’t hesitate to ask our staff for help! To help you start your day, we serve an extensive buffet breakfast every morning. We choose high-quality, locally-produced, authentic, Alsatian products to make your breakfast healthy and tasty. You will enjoy Alsatian Kougelhopf, baked by a local artisan baker. Different varieties of bread are at your disposition: bannettes and baguettes. As accompaniment for these breads, we have selected high-quality jams and honey. With all this, we offer you fresh fruit salad, yoghurt, cereal, delicatessen meats, hard-boiled eggs, fruit, and cheese. Among the beverages, there are different varieties of coffee, tea, hot chocolate, orange juice and grapefruit juice. Breakfast is served in our dining room from 7 to 10 am on weekdays and from 7 to 10:30 am on the weekend and bank holidays. To relax during the day or before returning to your room, hot and cold drinks are available at the hotel bar.